Comfortable tutoring groups? Lead a study group, group review session, and/or tutor multiple students together! The best part? You'll get paid a premium on your hourly rate for each student that joins the session, and individually, each student pays less –– talk about a win-win 😏 ! We've made it simple. Let the app take care of the logistics and payment and just focus on what you do best––helping students succeed. Pro Tip: If your students are okay with you inviting others, hit "Share Invite Link" and continue to rack up Premiums as additional students accept / join the session! Copy/paste the link to your LMS portal, Facebook Groups, GroupMe, etc. The Group Session details and the potential estimated cost for new students will be viewable by those with the link, and students may directly join from the link. You may choose to accept Group Session requests in the app from the “Tutoring Preferences” setting; if enabled, you’ll be badged in the search feed indicating you support Group Session requests. Once you've enabled Group Session requests: from the request screen, students will have the ability to invite others to the session. This student, who sends you the request and invites others, will be known as the "Organizer". As the tutor, you'll receive a session request where you can view invited students along with accepted/declined students. Group Rate Premiums will only begin applying as students accept their invites, see below. If the details work for you, simply accept the session request. If you wish to further discuss details with the students, we suggest communicating with the Organizer via messaging - click his/her name and then press "Message" at the bottom. Of course, you may also "Propose Changes" and edit the session details there - all students will then be prompted review and accept the newly adjusted details. You and the Organizer both have invite privileges. Before inviting additional students, please confirm with the Organizer that they're okay with additional students joining. Once confirmed, begin inviting additional students to the session through the app. Open the Session Request > Students > Invite Students –– you may search by name and invite existing Knack Users and/or your Contacts from your device's address book. Remember: The group premiums will only begin applying to your rate as students accept their invites, see below. 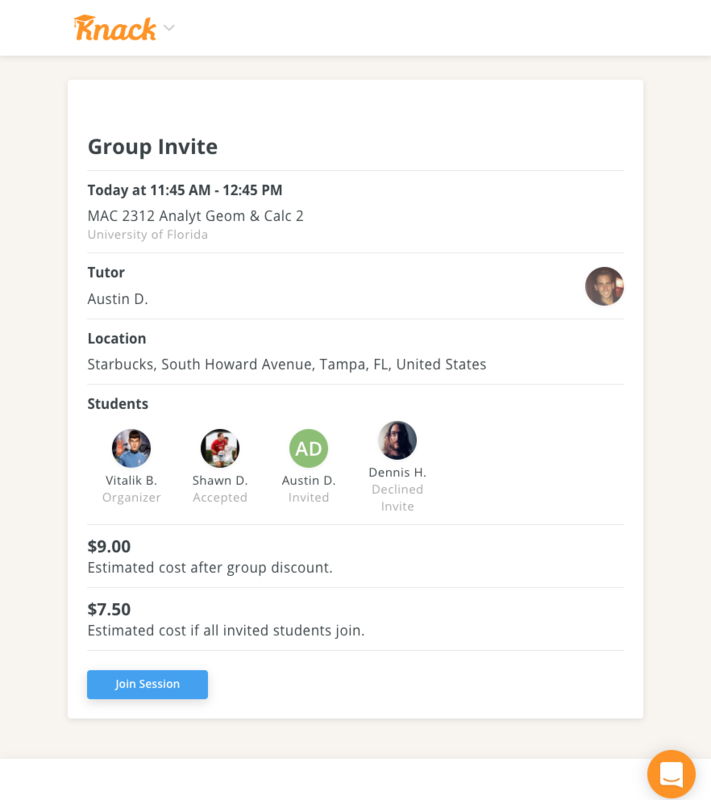 Here's a Cool Feature: You or the Organizer may hit "Share Invite Link" and you'll continue to rack up a Premium as additional students accept / join the session! Copy/paste the link to your LMS portal, Facebook Groups, GroupMe, etc. Share Your Referral Code with the Invite! Oh yeah and if you’re inviting non-Knack users, you may send your referral code along with the Group Session invite link and each student that joins will earn a $20 discount (and you'll still get paid your premium!). 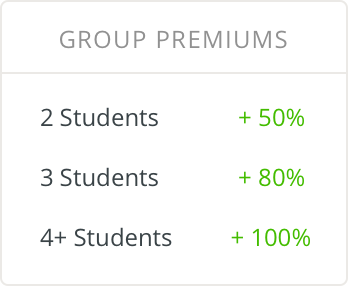 Once again, students must “Accept” their group session invites in order for everyone to earn discounts and for you to begin earning your Group Premium rate. Invited students may leave the session up until the start time. Fun Fact: Invited Students who have not yet "Accepted" may still join the Group Session even after it has begun by simply accepting their invite and everyone’s rate will adjust accordingly…all automagically! Once you and the Organizer/all accepted students are together, you and the organizing student will both press start on the timer to begin the session per usual. Once your group is ready to end the session, either you or the Organizer will simply press “End”. Got questions? Chat with us in the bottom right-hand corner.